The proposed mixed-use development, called Vista Del Mar, was designed by Studio E architect John Sheehan for developer Hamid Mani. The project is a five-story apartment/condominium complex with 511 square feet of commercial space on the ground floor. The front of the project is on Third Avenue; the back towers face a residential neighborhood. As a result of opposition to the project at an October meeting, the proposal was modified. The number of residential units was reduced from 80 to 76, eight guest/commercial parking spaces were added, and the number of balconies was decreased from 12 to 8. The December 16 format to review these modifications, however, increased attendees’ frustrations. 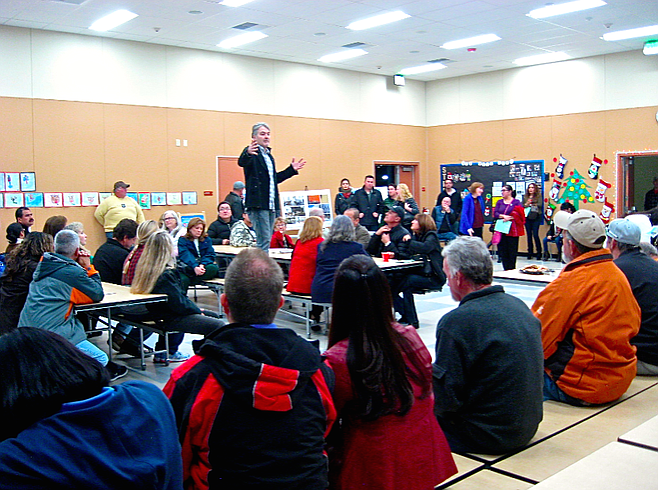 Instead of a presentation followed by questions, the public was invited to visit tables with architectural renderings and ask questions individually. There were approximately 60 people in attendance. Many expressed the opinion that the format was designed to circumvent questions in a public setting. As people began to circulate, former councilmember Rudy Ramirez commandeered the situation by standing on a bench and coordinating a second meeting. The architect, the developer, and city staff stayed for an additional question-and-answer session. One supporter of the Vista del Mar development stated that Third and K needed to be upgraded because the area was deteriorating and attracting homeless people. Another supporter said she has lived in western Chula Vista all her life and can’t yet afford a house. This development would give her an opportunity to live in a new and affordable place. Several people commented that they were not opposed to the project, rather that five stories was too big for the location and would generate excessive traffic and parking problems. “Give us a project that fits,” was a common refrain. Some residents were frustrated that elements of the project didn’t comply with the Urban Core Specific Plan that was hashed out by the community to govern area growth. People opposed, for example, the developer’s request for an exception to Urban Core floor-area ratio specs: the Urban Core Specific Plan calls for 1.5, but the developer is asking for 2.0. This increase translates to more square footage, which in turn increases the number of residential units. The architect responded that, in trying to be a good neighbor, the project design distributed the square footage away from the residential area and toward Third Avenue. Balconies were a strong point of contention. People from the residential streets behind the proposed building assert that Vista del Mar occupants will be able to peer into their backyards and windows. Near the end of the meeting, a resident asked the developer. “Why don’t you want to be a good neighbor and build only three stories?” Then the meeting took another curious turn. Developer Mani said, “Many people from the city came to me and asked me to do the project. There are people living in National City and East County. They could live in Chula Vista. “The city needs money. The city has economical problems. There is a university that the city is working on, so the city needs availability. There are jobs here. They need homes. The people of Chula Vista need help. I can go develop in National City or Hawaii if I want. Some people from the city came to my office today at 4 o’clock saying we are running out of apartments. City staff will continue to analyze the project; the date it will go before the planning commission has not been determined.